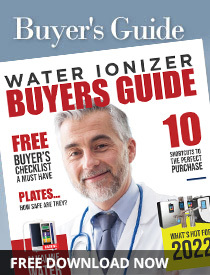 For the money, it's a good little water ionizer. It performs well in most source water and can be adjusted to overcome many source water issues. We don't like the "manual cleaning protocol" and had to maintain a sense of humor when we were working with the advanced settings but all in all the VS70 is a good buy for the money. The Chanson VS70 is a good "budget friendly" under-counter water ionizer. In our tests it performed as well as expected and we were pleased with the advanced features available for the price. At $2,395 it's probably the most affordable under counter model. As with all water ionizers, the VS70 has it's pros and cons. One of the user challenges with under-counter water ionizers is the limited information and selections available on the faucet controls. The Chanson VS70 addresses this with a small LCD display that shows you the level of water you've selected. You also have voice alerts at each preset that confirms your control panel selection. Chanson's under-counter water ionizer gives users 4 alkaline, 2 acidic and one neutral preset. The unit will default back to the last safe alkaline setting at each use or you can program a default setting through the faucet control panel. When not in use the unit will go into "sleep mode" to conserve power. "Waking it up' is as simple as touching the power button on the faucet. You can then make your pH level selection and then touch the power button again to begin water production. This unit will run a flush prior to each use. Once you've made your pH level selection and hit the power button to begin production ionization won't start immediately. You'll need to wait five to ten seconds for the flush to complete. Then the unit will confirm that ionization has begun and confirm your pH level selection with both voice and LED screen indicators. The length of the flush will depend on the length of time since the unit was last used. If you're using the unit first thing in the morning the flush will be longer. If you're turning the unit back on a few minutes later the flush time will be shorter. To make a pH level selection other than the default you'll have to toggle through the presets using the up/down arrows on the control panel. Not quite as "one touch" in its operation as Tyent's under counter model but this unit is also considerably less expensive. While you can adjust the pH levels of the presets, you'll want to study the manual for this process and keep it handy when you start. Once you enter the advanced settings mode you only have a few seconds to make each selection. If you pause too long to consult the manual the computer will automatically exit the advanced settings mode and you'll have to start again. The good news is that for most users you'll only have to adjust the settings once. The VS70 also has an option to adjust the unit based on your source water's TDS. Chanson USA recommends adjusting the power settings first and adjusting the TDS as a last resort. This model comes with a single high density carbon block filter which is rated to remove chlorine, lead and other common contaminants but Chanson USA recommends using a prefiltration system with their water ionizers. The good news here is that replacing the internal filter for your Chanson VS70 and the three cartridges in their recommended pre-filtration system will cost about as much as replacing the internal filters inside most water ionizers. Filter life is displayed on the control panel screen along with the time of day. The automated cleaning cycle runs on an internal sensor. When it's time for the unit to run an automated cleaning cycle, it will turn itself back on immediately after you've used it, run it's cleaning cycle and then shut itself back off again. Chanson USA recommends cleaning their VS70 unit every six to 12 months depending on your source water. Cleaning cartridges are not available. Instead, Chanson provides a cleaning protocol for you to follow. This involves dissolving citric acid crystals in warm distilled water, running the unit at the neutral setting for a short time and then allowing the unit to "soak" for up to several hours. If you're in a hard water area Chanson recommends repeating the process a couple of times to ensure effective removal of any excess scale buildup in the unit. Warranty Limited Lifetime Warranty: Parts and labor covered for five years then parts covered for as long as you own the unit.